Desarrollado sobre el chasis del PzKpfw 38 (t) en el otoño de 1939. El nuevo prototipo utilizó técnicas de soldadura en vez de remaches. El motor de 200 CV permitía acelerar hasta una velocidad de 62 km/h. El vehículo nunca se produjo a gran escala. Essentially a Pz.Kpfw. 38 (t) with more armor, more hit points, a higher top speed, but lower acceleration. The "nA" in the tank's name stands for "neuer Art", which might be considered similar to the term "State-of-the-art" in English. Its fully upgraded cannon is surprisingly powerful and is even able to damage a tier VII tank in certain situations. However, it is slow in reverse, making reversing an unreliable way to get out of a jam. The Pz38nA is one of the most misunderstand and under-rated Scout tanks in the game. Most players can not advance past its slow acceleration and poor traverse rate, thus it ends up being labeled a dog. It is far from that. Once you adjust your play style to the 38nA's lack of agility, you begin to unlock the true potential of this little gem of a Scout. It is fairly small and is blessed with the best View Range for Tier IV Scouts, making it an excellent Passive Scout for its Tier. It can completely dominate same tier fights and still contribute offensively in Tier VII matches if running premium ammo. As with most Scouts, your goal once the initial passive spotting phase is over should focus on flanking and sniping or performing drive by attacks. 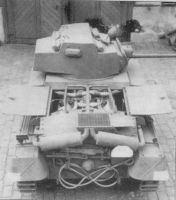 Both the FuG 5 and FuG 8 radios carry over from the PzKpfw 38 (t), as well as the 4.7 cm PaK 38 (t) L/43 gun, which should be installed immediately. Research the Praga NR engine first. 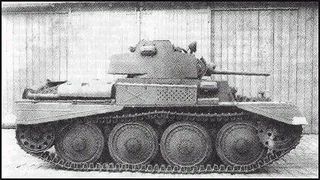 Developed on the chassis of the PzKpfw 38 (t) in Fall of 1939, this prototype used welding technology instead of rivets for both the chassis and turret. A 250 h.p. V-8 engine allowed for acceleration to a speed of 62 km/h. The manufacturer indicated 15 were produced for prototyping and testing, but despite successfully passing all performance tests and achieving a very high speed, no order was placed. The vehicle never entered mass-production and never saw combat.